Well known throughout the 5 boros as “Master Pete,” Master Peter Parimithis holds a 6th degree (6th Dan) Black Belt in Tae Kwon Do. He also holds a 3rd degree black belt in Go Ju Ryu, a 2nd Degree Black Belt in the Joe Lewis Fighting system. 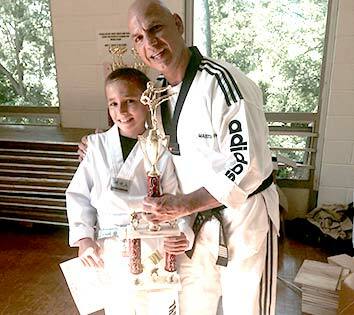 Master Pete has also trained with Phil Maldonado, “Super Foot” Bill Wallace, Terry Dow of Terry Dow Kick Boxing, Michael DePasquale Jr. – Ju Jitsu, Walter Lysik – ICAT, Jimmy Rassias, Jeff Troshan – Vadha Kempo, Anthony Albanese, Donny Caroli – Go Ju Ryu, Lenny Deluca – Ju-Jitsu, Vladimir Brodsky – Kung Fu Wing Chun/Tai Chi/Chang Chaun, and Staten Island’s own Grand Master Jhong Uhk Kim. Master Jimmy is the Vadha Kempo instructor at Island Martial Arts. In addition to his Vadha Kempo ranking, he holds a 2nd Dan black belt under the world kickboxing champion Joe Lewis and a blackbelt in Judo. Master Joe has been training for 25 years. He is also a gym teacher and stresses the “school” phase. Master Arthur has studied martial arts for over 14 years. Tom is 20 years old, but has been studying Tae Kwon Do for 15 years. He has held true to the art for all of his life. Cynthia has studied Tae Kwon Do for ten years.